The Rolls-Royce of ruby lasers! This page is dedicated to the Rolls-Royce of ruby lasers, those manufactured by JK Lasers of Rugby, England. The Club at this point is only a fantasy, or a farce, but it could morph into something real. SYSTEM 2000 LASERS FOR HOLOGRAPHY, JK Lasers Ltd publication LH-1, no date. The lasers before the HLS series. The System 2000 Lasers for Holography were a subset of SYSTEM 2000 Modular approach to solid state lasers. HOLOGRAPHY OF LARGE VOLUMES USING HOLOGRAPHIC SCATTER PLATES, J. M. Webster, B. A. Tozer, C. R. Davis, Optics and Laser Technology, June 1979, p. 157. A reprint of the article with a JK Series 2000 cover sheet, found with literature incuded with the Anait laser. PULSE STRETCHER CIRCUIT DIAGRAM, Fermi National Accelerator Laboratory, May, 1985. For the HLS-5 used to holograph particle tracks in the FermiLab 15 foot bubble chamber. PARTS CALLOUT, June 12, 1985. HLS LASER TEST INSTRUCTIONS, The Bard of Rugby, Issue 1, July 1985. HOLOCAMERA SET UP INSTRUCTIONS, The Bard of Rugby, Issue 1, July 1985. 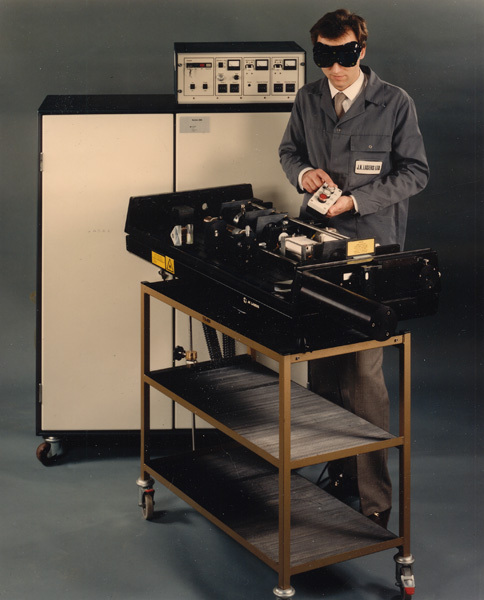 An article on "Holography in military training" in the August 1985 issue of Military Technology shows pictures of the Applied Holographics Holocopier, which is described below. AUTOMATED HOLOGRAPHIC MASS PRODUCTION, Simon Brown, Proceedings of the SPIE, Volume 615, p.46, January, 1986. Mainly about the Applied Holographics Holocopier, powered by a JK ruby. COHERENCE LENGTH TESTS ON HLS II LASER, Lasergruppen Holovision AB report, 1986 or 7possibly. Explores differences between coherence length holograms made at JK and Lasergruppen Holovision. Dr. Jim Wright explains why JK LASERS HAVE CHANGED THEIR NAME TO LUMONICS, probably late summer early fall in 1986. OPERATOR'S MANUAL The Bard of Rugby, came with the Anait HLS-2, Fall 1986. SERVICE MANUAL The Bard of Rugby,came with the Anait HLS-2, Fall 1986. DRAWINGS Came with the Anait HLS-2, Fall 1986. INSIDE JK LASERS, Ed Wesly, holosphere, Fall 1986.